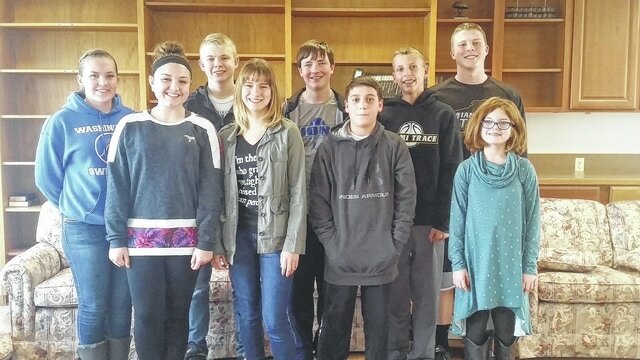 The Buckeye All Stars 4-H club held its first meeting at the Presbyterian church recently. The 2017 club officers were elected and are as follows: president – Max Schroeder, vice president – Adam Ginn, treasurer – Jack Luebbe, secretary – Jenn Richards, news reporter – Emily Haines, community service- Grace Gerber, health & safety – Haley Hixson, environmental – Sam Schroeder, and recreation – Bo Little and Jack Mead. The club also played icebreaker games and officers were sworn in by State Sen. Bob Peterson. Members are asked to bring canned foods to each meeting at the church.